An interesting slide show, intended to demonstrate that CO2 is the prmary driver of Earth’s climate; it is quite convincing at times, despite some basic weak spots. That is just my “take” on the slide show. Maybe others have come to a different conclusion. Recent Met Office research investigated how often decades with a stable or even negative warming trend appeared in computer-modelled climate change simulations. These guys are talking about “computer-modelled climate change simulations”, not the actual HadCRUT record. Prior to 1976 we had a multi-decadal cooling trend, which started around 1945 and is well known, but the record shows no such “negative global temperature trends” lasting nine or more years since the latest warming cycle started in around 1976, other than the one, which started after 2000 and has continued until now. If you think otherwise, please point out the nine-year period since 1976 with a linear rate of cooling of 0.1°C per decade. Keep those goalposts moving max #1245.
explained it with “natural variability”, and I can accept that. Apart from your misrepresentation that the 21st C would be cooling, yes I can accept that natural variability reconciles the record with the model predictions. Now Max, can you accept, as Tamino shows for the umpteenth time, that natural variability can not reconcile the record with the Ostrich Model? Max’s rambling 1245 says nothing. No surprise there. Max, what is making you think that IPCC or others here refuse the idea that the apparent “cooling” is a result of natural variability”? Brainwashing techniques often run this sort of procedure: make a statement that cannot be disagreed with and then make later statements that follow on but lead further from the truth until you’re left either disagreeing for no reason apparent in the short-term answers given previously or agreeing with an incorrect statement. But back to your statement, what is the result of accepting that the apparent cooling is natural variability with respect to AGW science? AGW science says nothing about natural variability around the climatic mean but about how that climatic mean is affected. Seems like Max can’t accept “natural variability” either. Why pick 2007? Why not pick 1998? And why pick on sea ice extent rather than sea ice volume? After all, you can take a thimbleful of jam and spread it much further on your toast than the surface area of the thimble extends. Would you call this a magial creation of jam, that you can increase the upper surface area so much? Also why pick on Arctic? There’s an Antarctic too. There’s also glaciers and so on. But you prefer to take a small section that says it’s recovering because you refuse to see any evidence that fails to prove you right in denying AGW. Hank (1239), and you picked November for Arctic extent instead of September because…??? Nice ripe cherry,perhaps? Uh, you mean natural variability could overwhelm the increases in CO2 of ***10 YEARS*** production. Well, so what? It wasn’t enough to overcome 150 years of industrialization, though, was it? So given that natural variability could overwhelm at least SOME period of CO2 production increases, how can that period being 10 years prove that 100 years was due to natural variability? Helpful hint: 100 years is much longer than 10 years. Hank (1246), the difficulty I have is that the cooling escapes explanation, which doesn’t necessarily mean they are wrong, but might indicate we don’t know what is going on. The “natural variability” rationale is just a hair better than “just because.” They do offer up El Ninos but as speculation (reasonable as it may be). Your reference says the models seem to predict a leveling off every 8th decade (actually a one chance in eight of having a level decade) but they don’t say why; nor did they presumably predict this decade. Though they did say, following their 1 in 8, we’ve had [three] warming decades since 1970 so we were bound to level off for one. Martin Vermeer says the question has been answered again and again and again. Trouble is the answer basically is, “Just is!” Maybe no one can put their physics finger on it with any certainty, and they’re still working on it. (Though the latter is under question: many seem to be satisfied with the “just because.”) I’m just curious, would like to know and think it is pertinent to the climate change science. What causes the global temperature to level off or even drop for a decade or so (and you can find a 10-year period dropping trend this decade with the right end points) in the face of steady GHG increases? Your standard retort which is ‘the statistically valid trend is straight warming so the cooling doesn’t exist’ doesn’t cut it. As I said to Ray that’s answering a different question. The question is why did global temperatures level off or even drop this decade. I, at least, am NOT claiming “global cooling” in all its splendor of long term trend lines and such. Rod B., The trend from last year to this year is very significant warming of several tenths of a degree. Should we be concerned? The trend from 2007-2008 was significant cooling? Should we heave a sigh of relief or start moaning about the possibility of an ice age (as some denio-alarmists are doing)? Five of the top six, this decade. That doesn’t look like cooling, unless you want to look at 2005-2008 and much of that is explained by the ENSO going from El Nino in 2005 to La Nina in 2008. So, what people are saying here is that the observed temp trends are utterly irrelevant when discussing anthropogenic causation of the current warming epoch. Is the variability interesting in its own right? You bet. There are probably more climatologists looking at the variability than there are looking at the greenhouse effect of CO2, which is established science. The thing is that this is a lot harder than the greenhouse effect, because there are tons and tons of potential causes for such short-term variability. Some of them probably aren’t even known at this point. However, because they are short-term, though, they don’t pose a threat. As such, they will be the stuff of PhD theses and discussions between climate nerds rather than a blog devoted to the popularization of climate science. Rod, November was the most recent item, but the link is to the ongoing discussion at the website, you can read about the entire history there. I expect you to make an effort, or pretend sincerity at least, not just throw out nonsense. Please, do better. You’re about the best skeptic we have. As to ‘escapes explanation’ — so does any run of heads or tails if you start flipping coins. You want an absolute explanation from Newtonian physics of how everything works? It doesn’t work in a completely determined way, unless you want to argue from predestination. Look at a short stretch of the record from flipping ‘heads or tails’ — how many in a row? Look at a longer stretch of the same record — how many in a row? If there is a trend — a loaded coin — you’ll start to see signs of it emerging after you flip it enough times that the load bias begins to emerge from the noise. Look at a coastline — little wiggles. Back up; bigger wiggles. Back up further; bigger yet. If there is a trend, like a change in the geology or currents, it will start to emerge after you have enough information. Look at the yearly single annual temperature number for a decade; for three decades; for a century; for as long as we have information of any kind. What do you see? Wiggles, and trends. Please don’t go back to “but I see it” or “but why isn’t ten years enough” — we know you know those answers. Or you did know them last week, and last month, and last year. Hmmm, come to think of it, there’s a trend emerging. Psst! Rod! Own goal! November’s much closer to what used to be normal than September was, for good reason. Here’s both monicker and Rod asserting misinformation about what the MetOffice says. Uncited. Apparently each considers the other a reliable source, and they don’t need a real source. WTF? “… Many climate sceptics point to the fact that 1998 was the warmest year on record, and say that because no year has topped that since, there must have been global cooling. However, to look at one year in isolation is effectively seizing on an extreme of natural variability and using that to judge long-term climate. It’s the underlying trend that is important, which is why you can only make judgements over longer periods of time. There’s more than 150 years of data displayed in the inset image, and the last 50 years displayed in the larger image. Colors indicate which range of decades that year is from. Look at the last 20 years, for example, or the last 10, or 11 years. You have to work hard to fool yourself about this picture. Ask Dr. Akasofu and Doug Bostrom, not me. And why pick on sea ice extent rather than sea ice volume? 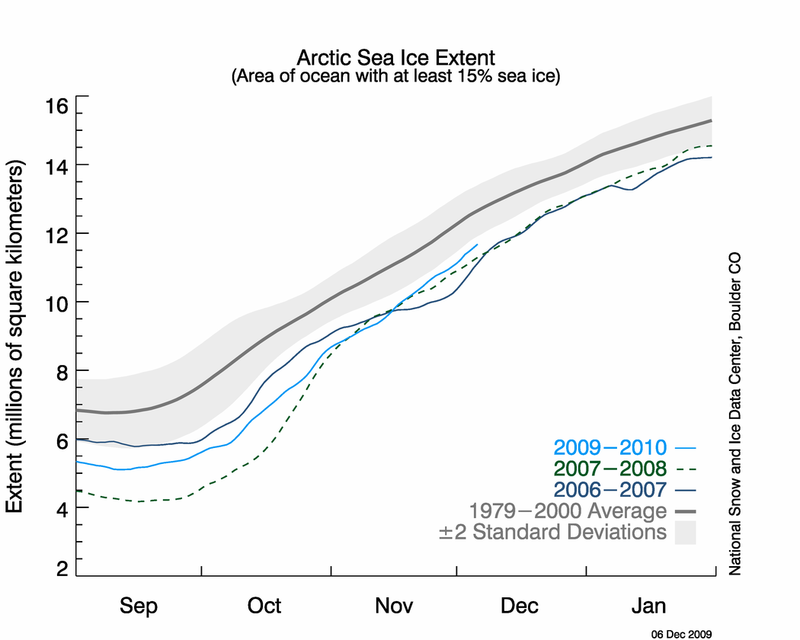 Ask the NSIDC, who publish monthly readings of sea ice extent and area, but not of volume. Also why pick on Arctic? There’s an Antarctic too. Again, CFU, ask Doug Bostrom and Dr. Akasofu (who both picked the Arctic). NSIDC tells us that Antarctic sea ice has been growing steadily since satellite records started. This is reported monthly but does not get much coverage in the NSIDC PR releases, which tend to concentrate on the Arctic. There’s also glaciers and so on. Indeed, CFU, but we are drifting off from Doug Bostrom’s original reference to Akasofu’s paper, which made a claim on Arctic sea ice recovery from its all-time (modern) low of 2007. But you prefer to take a small section that says it’s recovering because you refuse to see any evidence that fails to prove you right in denying AGW. Who is denying AGW? Not me. But let me ask you a specific question concerning denial: Are you denying that the Arctic sea ice extent recovered by 25% from its end-summer 2007 low end-September 2007? CFU, you should try to stay focused on the topic that was being discussed, rather than rambling off into other directions. It makes a coherent exchange with you difficult. Met Office press release on natural variability as cause for current lack of warming. In the twentieth century we have had continued variability, but an underlying trend of warming in the previously steady long-term averages. This is what we observed in the 1970s, 1980s, and 1990s. Now we have seen a decade of little change in the average global temperature — but that doesn’t mean climate change has stopped, it’s just another part of natural variability. A precipitous drop in North American temperature in 2008, commingled with a decade-long fall in global mean temperatures, are generating opinions contrary to the inferences drawn from the science of climate change. We use an extensive suite of model simulations and appraise factors contributing to 2008 temperature conditions over North America. We demonstrate that the anthropogenic impact in 2008 was to warm the region’s temperatures, but that it was overwhelmed by a particularly strong bout of naturally-induced cooling resulting from the continent’s sensitivity to widespread coolness of the tropical and northeastern Pacific sea surface temperatures. The implication is that the pace of North American warming is likely to resume in coming years, and that climate is unlikely embarking upon a prolonged cooling. So we have acknowledgement that there is a “current lack of warming” (or, actually, a linear cooling trend after 2000), which is being caused by “natural variability”, that is apparently overwhelming the anthropogenic GH effect. That is all I claimed. I made no claim that this is all part of a longer-term trend. Both of the reports I cited seem to believe warming will again start in the coming years, but I guess we will have to wait in order to see what really happens. I agree that a 159-year temperature record means a lot more than a 10-year or 30-year record. The long-term record shows a linear rate of increase of round 0.04degC per decade, which did not occur smoothly, but rather in multi-decadal ups and downs, as discussed earlier. The less meaningful last 30 years shows an increase of around 0.15degC per decade, as did a 35-year period from 1910 to 1944. In between there was a period of slight cooling. The record after 2000 shows a cooling rate of around 0.1degC per decade. I would give less significance to any of these shorter-term records than to the long-term record, so I suppose we agree on that point. Believe my post to CFU on long-term versus short-term records gives a response to your 1263. We both agree that long-term means more than short-term. Probably. Ought to at least keep a sharp eye out. Certainly not; and if you understood my earlier post this answer won’t be a surprise. BUT, a good scientist should be strongly wondering why. You imply they are. Good, though I haven’t heard of any. Hank (1260), so are you saying those wiggles are just random or problematic deviations from random, like coin flipping? Hank, it looked like September was logical metric since that’s the normal low point. Hank, Ray, et al, for the 47th (and last — since it’s clearly a lost cause) time — I’ll go slow: I…AM… NOT… HERE… ASKING… ABOUT.. OR… JUDGING… LONG… TERM… CLIMATE. and claiming they’re part of the long term record. Ain’t. North America, as distinct from the global temperature. Where’s that goalpost? Max moved it again! A precipitous drop in North American temperature in 2008, commingled with a decade-long fall in global mean temperatures, are generating opinions contrary to the inferences drawn from the science of climate change. Got it this time around? I don’t want to sound like a broken record, but as 2009 comes to a close (in 6 hours, 9 minutes where I live), and 2009 isn’t a new record high year, is there a point after which the 12 years from 1998 becomes “climate” and stops being “weather”? Because I’d like for “no new record high years” to become “climate” so people will start taking a serious look at the SUN. And I’d like people to do that because if 2010 isn’t a new record high year, the amount of credibility that CO2-caused AGW is going to have with the great unwashed masses is going to go DOWN. Which is not the direction it needs to be going. Ray, et alia can talk about how we “spot” patterns, because our brains are wired that way, but this is the third winter in a row here that’s a ‘winter’ and not a ‘really long fall’. And this is the third year in a row I’ve been bleating on about SC24. And it’s just starting to be a trend. So … unless someone can explain WHY we’ve not had a new record high year since 1998 (and do NOT drag out 2005), perhaps that’s the research project for 2010? Figuring out what “weather” seems to be slowly turning into “climate” and not of the late 1990’s hockey stick shaped climate, but more of the air hockey table shaped variety. Max, look at the paper. They cite Easterling and Wehner. And they are talking about North American temperatures, and the differences seen, as discussed in earlier work. Look at the citations, man, don’t just quote bits you like. Easterling, D. R., and M. F. Wehner (2009), Is the climate warming or cooling?, Geophys. Res. Lett., 36, L08706, doi:10.1029/2009GL037810. Hansen, J., R. Ruedy, M. Sato, M. Imhoff, W. Lawrence, D. Easterling, T. Peterson, and T. Karl (2001), A closer look at United States and global surface temperature change, J. Geophys. Res., 106, 23,947 – 23,963, doi:10.1029/2001JD000354. Max continues doing exactly what the above authors have forecast, misconstruing the results that they, and Hadley, and Tamino, and others have explained. And claiming people agree with him. Sorry, Max. Not even interesting any more. Bye for now. No, I’d have to say “look at the last 20 years” to avoid reaching the only conclusion that can be reached by looking at all 150 years. Guess, what — the trend has been “up” for the past 150 years. For that matter, it’s been “up” for the past longer than that, going all the way back to the (supposedly non-existent) Little Ice Age. I keep seeing someone saying that there has been cooling for the past decade. Here is the temperature data for every year since 1998. THe first column is the year. The second column is the temperature anomaly. I fit the period from the extremely hot 1998 El Nino year to 2009 and I get warming. I fit from 2001 to 2009 I get warming. Certainly if I fit from 2008 to 2009 I will get SCARY warming (13 degrees per century). The assertion repeated over and over again that there has somehow been really really significant cooling over the past decade is really really disingenuous. Dr. Akasofu’s specific assertion about Arctic ice, “The area of sea ice in the Arctic Ocean has begun to recover after the drastic reduction in 2007” seems to imply the identification of a trend in ice extent even though less than two years had elapsed since 2007 when he formed this conclusion. That bold leap leads one to examine the rest of the paper more closely; is the entire work so generous in assigning unwarranted confidence in questionable conclusions? In Figure 1 of Dr. Akasofu’s paper, I see that he identifies a “multi-decadal” oscillation visible to him in temperature records. He then draws an extrapolation of this putative oscillation extending into the future. Indeed as was discussed in previous posts here, I don’t see any mathematical explanation of this approach. The neatly perfect sine wave glued onto the future of global temperatures seems to have come entirely from visual scrutiny of records since 1880. The record is certainly suggestive of cyclic swings in temperature, but without any further analysis the idea seems incomplete at best. The piece seems more like personal musings on the part of Dr. Akasofu. It does not seem to have been published, at least not in the form I’m citing, and I guess that’s no surprise given the relatively relaxed approach he’s taken in defending his central hypothesis. Also, I’m curious to know, if one is a contrarian and has serious problems with temperature records, does one believe Dr. Akasofu’s work, which is substantially based on those “problematic” temperature records, or does one dismiss Dr. Akasofu’s work as flawed for the same reasons that one would reject other conclusions formed from the same record? It’s hard to see how the same records that are so questionable as to invalidate one hypothesis can be used in support of another. I can’t help but notice, all those numbers are positive. If the planet is cooling, shouldn’t there be some negative numbers there? Why? HadCRUT leaves out the polar regions. Why would you choose it over GISTEMP? What makes you think people don’t look at the sun? Scientists aren’t stupid. Anyway, we know that lengthy stretches of flat temps are not in the least bit unusual and are to be expected with a weak (but inexorable) warming signal imposed on a noisy climate. What’s the problem? This is a logical conclusion, but certainly not the only one that could be drawn from the statement by Dr. A. He could have meant that the “drastic reduction in 2007” was anomalous to the longer-term record of gradual reduction, and that the observed short-term recovery from this anomalous low point in 2007 to a more typical point in 2009 could signal a return to the longer-term trend of slow decline (at least since satellite records started in 1979). At the time of the “drastic reduction in 2007” (late summer, end-September reading), I do recall rather alarming claims of an imminent ice-free Arctic, which turned out to be exaggerated, as Vicky Pope of the Met Office remarked, when she actually chastised some scientists and the media for overhyping short-term changes, such as the anomalous late summer 2007 decline. In Figure 1 of Dr. Akasofu’s paper, I see that he identifies a “multi-decadal” oscillation visible to him in temperature records. This is correct. They are actually quite easy to see, as I have also remarked earlier and shown with a graph showing the linear trend lines for these warming/cooling cycles. He then draws an extrapolation of this putative oscillation extending into the future. This is correct. Dr. A. postulates that the temperature record has shown multi-decadal oscillations in the past, caused by several natural forcing factors and superimposed on a gradual long-term warming trend, as we have emerged from a colder LIA. He postulates further that this cyclical trend will continue into the future, and that the most recently observed cooling is the beginning of a multi-decadal cooling oscillation in the record. The record is certainly suggestive of cyclic swings in temperature, but without any further analysis the idea seems incomplete at best. I would agree. I would also agree that all of climate science is “incomplete at best”, and that any notion that “the science is settled” is silly. There are, of course, others who have come to a similar conclusion, such as several solar scientists and Peter Taylor, in his book “Chill”. Many of these individuals do not dispute the GH theory or that CO2 is a GH gas or that CO2 concentrations have increased over the 20th century or that human CO2 emissions have contributed to this increase or that this may have contributed to the observed long-term warming trend. They just point out that there are other factors at play, which are underestimated by the “mainstream scientists” cited by IPCC, who tend to concentrate on anthropogenic forcing to the essential exclusion of significant natural forcing. Your final point was on the validity of the temperature record itself. There are many studies out there, which indicate that the surface record has some built-in distortions due to the UHI effect. However, the tropospheric record (with no UHI distortion) also shows a warming trend, albeit at a slightly lower rate than the surface record, and only since 1979, when satellite measurements started. But the surface record we have (HadCRUT, GISTEMP or NCDC) is the only long-term record that exists, so we must rely on it for long-term temperature data. It’s hard to see how the same records that are so questionable as to invalidate one hypothesis can be used in support of another. I do not believe that this is what Dr. A. is doing at all. He has accepted the surface record “as is”, with all the “warts and blemishes” it may have, because it is the only long-term temperature record there is. Are we agreeing to agree on a few points? Why would you choose it (HadCRUT)over GISTEMP? Because IPCC uses it as its standard of reference. No. They are not stupid, but IPCC gives ALL natural forcing factors (1750 to 2005) a value of 0.12 W/m^2 (which it estimates by considering direct solar irradiation alone), while all anthropogenic forcing factors are estimated at a value of 1.6 W/m^2 (CO2 alone is 1.66 W/m^2). So IPCC did not “look at the sun” very hard. Just look at AR4 WG1 Chapter 2 and SPM. IPCC wrote it (and all other natural forcing factors) off as essentially insignificant to our climate, although it conceded that its “level of scientific understanding” of solar forcing was “low”. Yet it is precisely these natural forcing factors (a.k.a. natural variability) for which the current cooling (or “lack or warming”) is now being attributed. However, 2005 is arguably warmer than 1998, taking into account warming in polar regions (ala GISTEMP), which should not be neglected. they’re still working on it. What is also very well understood is that this is chaotic behaviour. Meaning that if you want to reproduce the real world, you have to initialize your model to a real-world state; after that, the model will reproduce real-world natural variability (including el nino, the biggie here), for a number of months, perhaps a year or so… after which the model-reality synchrony is gradually lost. Just like predicting the weather, only on a somewhat longer time scale. Claiming that scientists say “Just is!” is a slur and I resent it. “Noise” is in the eye of the beholder, like the GPS system pseudo-random codes, which also behave randomly but are in fact generated deterministically by an electronic cicuit. You can model natural variability as noise, with certain statistical properties, if something else, e.g., long-term trends, is what you’re interested in. Or you can go for physical modelling, e.g., to study el nino.